My wife (a nurse) and me (a chiropractor and nutritionist) were beyond frustrated. I called one of my mentors at the time and he recommended I check my infant daughter's gallbladder meridian reflex using Contact Reflex Analysis. I was thinking - how could a gallbladder be problematic in a baby...but I checked her and sure enough, the testing showed a problelm. The solution was to use an actract of beets that would thin the bile. The result: NO MORE VOMITTING! I was amazed and very pleased...but I didn't understand how my mentor knew to check the gallbladder meridian point until years later. 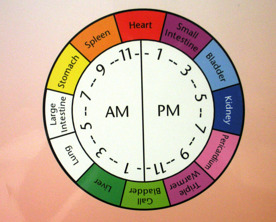 What I discovered in my incessant search for healthcare knowledge was a concept called the meridian time clock while studying Nambudripad's Allergy Elimination Techniques (NAET). Now the mystery was solved. My mentor knew about the concept of the body meridian clock and the gallbladder meridian is most active between 11:00pm and 1:00am. When there is a block in the flow of energy through a meridian (or too much energy for that matter) the body will produce symptoms indicative of an upset in the balance of the body adaptative processes (called homeostasis). Recently another of several patients presented with recurrent gut pain that occurs starting around 11:00pm. Since I am now aware of this relationship of time to meridians (and potentially a particular set of symptoms, I instinctively checked the gallbladder meridian...and yes, the meridian was active. Through the procedures of Nutritional Response Testing (NRT), indications for using a specific supplement showed potential for helping this patient with her health challenge. Additionally in this particular patient, proper testing revealed autoimmune attack on her small intestines and beyond. Previous lab tests done at other doctors offices and hospitals showed no problems whatsoever, which is why I use very specific cutting edge valid tests, that at this time are about 30 years ahead of the standard of care. Evaluating tests from a functional perspective is also one of the reasons I am able to locate underlying causes to health issues that are not found with traditional test evaluation. Interrupt nerve signals in the body and alter levels of neurotransmitters and thus cause nerve and brain malfunction leading to ADD and even Alzheimers disease. Create joint inflammation leading to various types of arthritis. The message I hope to get across, is there are many ways to understand the underlying causes of gut pain. I most often find that autoimmune attack is present, but hasn't been tested for...and that gluten and other proteomes, or epitopes, are invoking the expression of autoimmunity and your subsequent health challenge(s). Avoid the substances that testing reveals is causing immune system activation and thus triggering autoimmune attack, by making dietary changes. Embrace changes by learning about your health challenge and how your body works. See a practitioner who has a variety of health promoting tools so you don't have a one-sided approach to solving your health challenge. As always, I welcome your comments and questions and if you need help with your health challenge, click on the big orange button below, or call my office at 586-731-8840.